Jimmy Carter defeats Gerald Ford, but he still has much to prove. 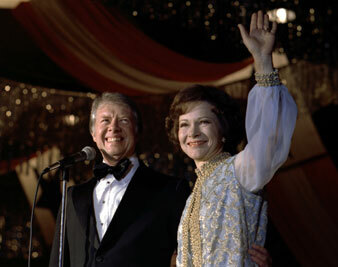 Everett Collection Jimmy Carter and First Lady Rosalynn Carter at the Inaugural Ball, Jan 20, 1977. Like a slight majority of American voters, The Nation is relieved by the results of the Presidential election. It is reassuring that this country did not choose four more years of heartless immobility under Gerald Ford. It is comforting to know that the GOP advertising blitz, ending in that gaudy, soap opera on election eve, could not tip, the balance. The question of “mandate” immediately arises This vogue word has been much used by pundits as the polls showed Governor Carter’s early lead slipping. The burden of it is that if Carter were to win by a slim margin, he had better take it easy and be cautious in what he tried to do. In fact, the only clear mandate on November 2 was for Gerald R. Ford to go home to Grand Rapids. Carter was elected to be President, in the normal constitutional way. His instructions from the American people are to act as President — above all, to act. That implies that there is much to be done in this country, and there surely is a long agenda of measures that only government can take to make this system work. Perhaps these unmet needs of the people were finally what was on the minds of the majority of voters when they went to the polls. They had a choice between the fake “activism” of Ford, consisting of an aggressive stance abroad and vetoes for programs dealing with domestic problems, as against the commitment to change expressed both in the Democratic platform and by Carter. However much Carter may have wavered on the key issues of justice and fairness in the early part of his campaign and under the influence of his calculating handlers, the fact is that he returned at the end to positions which may justly be called compassionate. That is, he was expressing a genuine concern for the problems of all the people of this country and not, as Ford shamelessly did, just its middle-class segment. The President-elect, quite naturally, has much to prove to the people. The way he is now seen is distorted by a campaign in which the media played a most undistinguished role, as Harry Ashmore documented in The Nation of November 6. But Carter can now forget what he had to do, or felt he had to do, to get elected and turn his attention to how he can act as President. He can, and should face the real issues that confront him and all of, us. He can draw up a short list of priorities that he will vigorously deal with in the early days of his Presidency. He will not, of course, be able to do everything at once, as Franklin Roosevelt discovered at an even more trying moment in our national life. But if he focuses on a few major questions, and can act in an approximation of harmony with a strongly Democratic Congress, he will find that he can rally great popular support behind his efforts. We would suggest that in domestic policy, he concentrate on eliminating many of the inequities which years of bowing to corporate interests have inflicted on the public. That means, among other things, persuading Congress that the grotesquely unfair tax structure must be radically changed. It means a comprehensive healthcare system which eliminates the worst of the corruptly combined two worlds of private enterprise and bureaucracy. It means serious attention to the problems of the cities, wastelands where most Americans live. It includes developing and imposing, at last, a proper energy policy, one that preserves our surroundings and lessens our dependence on Arab princelings. The list is long, after years of neglect, but these are some of the priority items. They require a vision which recognizes that the United States is profoundly threatened, as a system and as a civilization by crises of conscience, confidence and structure. Carter has suggested, here and there in his speeches, that he is aware of these challenges. One is entitled to hope that he will be thinking mainly about these great questions, between now and January 20. It would be deeply disappointing if Carter did not quickly show his concern about the system of “friendly” dictatorships around the world upon which his predecessors have built a structure which they say is essential for our “national security.” This structure can be looked at morally or practically, and the verdict Is the same — it must go because it outrages every decent sense and also because it does not work. And so we can join what we believe to be the majority of Americans in saying that the election spared us the worst — and gave hope for the best. The realization of that hope depends on Carter and the Congress he will have to work with. The omens will start appearing very soon, and, like most Americans, we shall be watching with a kind of optimistic apprehension.